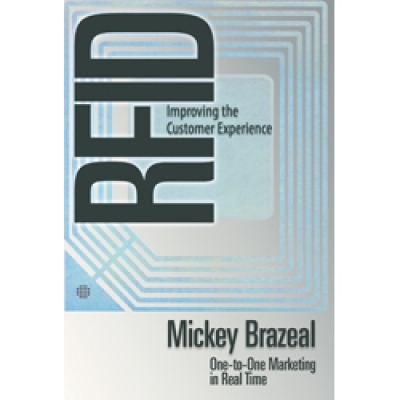 "RFID Improving the Customer Experience by Mickey Brazeal"
There's no question that the customer should be king these days, but many companies have trouble finding ways to improve the customer experience. 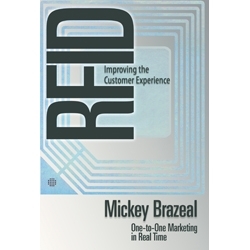 Author Mickey Brazeal says one solution is new and expanded uses of RFID (radio frequency identification). From product and food safety to cutting the costs of health care and bringing point of sale to the shopping cart, Brazeal explains how RFID will improve the customer experience, while introducing efficiencies to the marketplace. Think about what would happen if a customer looking for a certain size and style in the apparel store could instantly know whether it was available and where it was in the store. Think of how reassured customers could be if they knew exactly where their vegetables and meat came from and whether they had been adequately temperature controlled on the way. Think of how much hospitals could save if, instead of duplicating equipment like wheelchairs, staff just knew the location and availability of every one they already own. Think how much more material could be kept out of landfills if it were easier to sort and reuse materials. These are just a few of the uses of RFID that Brazeal describes. Brazeal tackles the subject of privacy head on with a chapter that discusses how companies can use RFID to benefit customers while still respecting their privacy. The future of RFID is limitless. With many examples and "what ifs,"
Brazeal challenges his readers to think about how RFID can improve the customer experience in countless ways. The book includes an appendix to help the uninitiated learn how RFID works and a detailed bibliography for further reading.